In Boston, more people are cycling than ever before, including workers, residents, school children and tourists. From the Charles River Esplanade to the North Bridge near the Zakim, Boston is a fun city to explore on two wheels. Whether you are a bike commuter or ride for recreation, it is a good time to be a cyclist here. Over the past decade, city officials have added more than 100 miles of bike lanes and brought bike shares to the city. First came Hubway in 2011, then the Blue Bikes were announced in 2018. Be prepared. Taking the time to learn about bike lanes, dangerous intersections and your responsibilities as a cyclist can help you make better decisions and avoid bicycle accidents. The City of Boston offers this web page to help cyclists plan their routes and make use of the MBTA (bikes are allowed on many lines). Another resource is the Go Boston 30 plan, which reports Boston has created 105 miles of bike lanes and 6 miles of protected bike lanes since 2008. As of March 2018, Hubway operated 185 bike share stations in Boston, Cambridge, Somerville and Brookline. More are expected as the Blue Bikes are introduced. As a cyclist, you should always wear a helmet and make sure you have proper safety gear, including bike lights to neon safety vests. Bike lights are required by Massachusetts law. Safety vests are not, but are an inexpensive way to protect yourself. Where you are cycling is important. You should generally travel on the right side of the road, going in the same direction of traffic. But cyclists are allowed to ride in the center of the traffic lane, up to two abreast. Cyclists are generally not allowed to ride on sidewalks in business districts in Massachusetts. They are allowed to do so outside business districts if it is necessary for safety, unless signs are posted otherwise. The bottom line is riding on the sidewalk is generally not encouraged. The City of Boston's website says you are allowed to ride on the sidewalk, but encourages you to use the street. If you ride on the sidewalk, always yield to pedestrians. Wherever you travel, cyclists must also follow the same traffic laws as motor vehicles, including stopping at red lights. To learn more, read the Facts About Cycling in Massachusetts. If possible, plan your travel to avoid dangerous intersections. A couple areas to note are Massachusetts and Commonwealth avenues and the Packard’s Corner area, near Commonwealth and Brighton avenues. This is an old map, but the Boston Bikes map is a starting point for learning about dangerous intersections in Boston. Do your research and check online maps after reading this. You can also visit the Boston Cyclists Union's website to learn about dangerous areas and traffic improvements being sought for cyclists. Bike shares came to Boston in 2011, with the arrival of Hubway. New Balance was the major sponsor. In 2018, the City of Boston announced it was transitioning to a new sponsor, Blue Cross & Blue Shield, and Blue Bikes. Until the transition is made, you can find information here about Hubway and the Station Map. Bicycle helmets are the most effective way to prevent a head injury or brain injury in a bicycle accident. The City of Boston reports 72 percent of its cyclists wear helmets, but it is actively trying to increase this number. Discounted helmets are available from some retailers. When possible, call the vendor to see if helmets are available. Massachusetts law says you can park your bike anywhere it does not disrupt vehicle or pedestrian traffic. The City of Boston has installed over 1,500 bike parking spaces over the past three years. You can find a bike rack before you make your trip by visiting this Boston Bike Parking map. The law requires you to report any bicycle accident resulting in $100 or more in damage to police. If injuries are serious, you should visit an emergency room. One of the most common types of bicycle accidents in Boston and Cambridge is dooring. In the City of Boston, cars are banned from parking in the bike lanes. Drivers can be fined $100 for this offense, which can cause serious injuries to cyclists who cannot stop in time or are forced to swerve into traffic. But dooring often happens when drivers park next to a bike lane and open their door without checking for a cyclist. The sudden impact between a cyclist and a door can cause serious bodily injuries, including dental fractures and broken bones. Dooring is against the law in Massachusetts and punishable by a $100 fine. 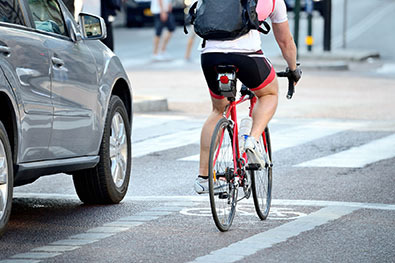 Drivers can also be held liable for the cyclist's injuries. Many cyclists do not know they can purchase protection for bike accident injuries and financial losses through their car insurance policy. The coverages are often affordable and it is worthwhile to ask your agent. Read more in our article, What Every Massachusetts Bicyclist Needs to Know About Car Insurance. The Boston bike accident lawyers at Breakstone, White & Gluck are committed to promoting safety for cyclists and pedestrians in Massachusetts. Our Project KidSafe campaign has donated over 20,000 bicycle helmets to children across the state and we are proud to sponsor bicycle clubs and advocacy groups which are also committed to promoting safety. If you have suffered an injury caused by someone else's negligence, contact us for a free legal consultation at 800-379-1233 or 617-723-7676 or use our contact form.